The Boston Globe's David Scharfenberg published an "ideas" piece on Friday in response to the recent Texas mass shooting in which he espoused a self-described "radical," "sweeping" policy change to curb gun violence in the United States. "Hand Over Your Weapons," Scharfenberg wrote, arguing that less drastic measures proposed by Democrats and gun-control advocates are too "limited." Trouble is, it’s not clear the "something" Democrats typically demand would make a real dent in the nation’s epidemic of gun violence. Congress can ban assault weapons, but they account for just a tiny sliver of the country’s 33,000 annual firearm deaths. And tighter background checks will do nothing to cut down on the 310 million guns already in circulation. The piece went on to say cite previous comments from Democratic presidential candidate Hillary Clinton, who spoke positively about the Australian gun buyback program. The program collected more than 650,000 weapons following the 1996 Port Arthur massacre where 35 people were killed by Martin Bryan, a "deranged" Australian man with a semi-automatic rifle. Former President Barack Obama also praised the confiscatory approach when he cited the Australian gun buyback model during a speech in 2015. Scharfenberg went on to argue that the logic of gun control ultimately lies in "substantially reducing the number of deadly weapons on the street," and that confiscation is "far and away the most effective approach." Following the Port Arthur mass shooting, the piece said Australia's conservative Prime Minister John Howard acted swiftly by announcing a full slate of gun restrictions, including a "ban on automatic and semi-automatic weapons and shotguns, an extensive registration system, and a 28-day waiting period between getting a permit and buying a gun." The centerpiece of the gun restrictions was a mandatory gun buyback, which also meant the implementation of a temporary tax to finance the government purchase of hundreds of thousands of weapons deemed illegal under the new laws. Scharfenberg said Howard and others feared violent resistance at first, but said the buyback process went forward peacefully and the country hasn't had a mass shooting–one resulting in the death of five or more people, not including gunman–since the process was implemented. He noted some U.S.-based support for a government mandated gun buyback. John Rosenthal, co-founder and chairman of Massachusetts-based Stop Handgun Violence, says it may be time to embrace a mandatory buyback — the relentless tide of mass shootings leaving weary activists with little choice. "I am so struggling right now to find the strength to keep going," he said earlier this week, a day after the Texas church shooting. "And guess what, I have been thinking a lot about Australia. They had that one horrific event, with 35 killed, with an assault weapon. 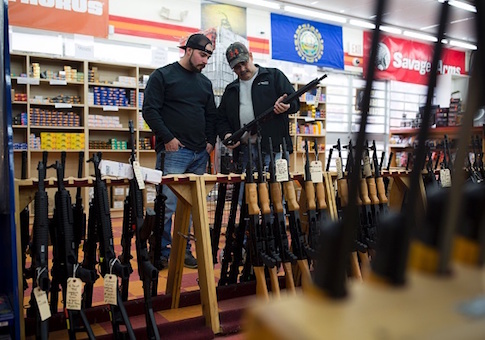 They banned them, they bought them back — and there hasn’t been a mass shooting since." It’s a model the Aussies themselves have been touting to any Americans who will listen — suggesting it could succeed in the United States with a little political courage, especially on the right. The piece recognized there was significant opposition to the program in Australia, but the prime minister "felt there was no alternative." In Australia "many farmers resented being told to surrender weapons they had used safely all of their lives," wrote Howard in the New York Times a few years ago. "Penalizing decent, law-abiding citizens because of the criminal behavior of others seemed unfair. Many of them had been lifelong supporters of my coalition and felt bewildered and betrayed by these new laws. I understood their misgivings. Yet I felt there was no alternative." Scharfenberg also said there are differences between the United States and Australia and that a gun buyback would be difficult in the United States because the National Rifle Association is more powerful and well-financed compared to Australia's gun lobby. He went on to say that the gun culture in the United States runs deeper than Australia because it is one of the "most important fault lines in American culture" and there is a "fanaticism" among three percent of the population that owns half the guns in circulation. The piece suggested gun-control advocates, for the time being, focus on proposing something less extreme than confiscation, noting that an operation on the scale of Australia would be "simply unimaginable." To claim one-fifth of American guns, tens of thousands of police officers would have to collect approximately 60 million guns. Instead of confiscation, he pointed to several examples of state lawmakers in California, Washington, Indiana, and Connecticut passing measures to allow "family members to seek court orders seizing guns from disturbed people before they can hurt anybody." Scharfenberg concluded by saying that in order to prevent further deaths, "there's no way around" confiscating millions of firearms. "Ultimately, if gun-control advocates really want to stanch the blood, there’s no way around it: They’ll have to persuade more people of the need to confiscate millions of those firearms, as radical as that idea may now seem," he concluded.